Clio has a line called Goodal, and a basic search told me that this is their line that focuses on a clean ingredient list and naturalism. Now since it is asian products and I don’t exactly know how each country regulates what is natural or not, I am usually suspicious. Like literally I believe that they do use more natural ingredients but there is also a good amount of chemicals in there. But in my opinion, unless you make it yourself, that really is most companies asian or not. 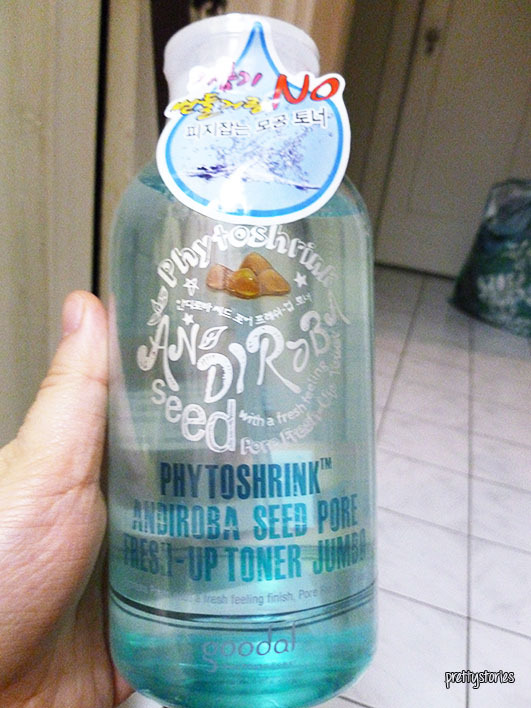 So I got this lovely toner called Phytoshrink Andiroba Seed Pore Fresh-Up Toner Jumbo. They call it jumbo because it is larger than regular toner bottle sizes. From the back there isn’t a lot of english. The only english I can find is the following. Smoothes, moisturizes your skin while purifying and tightening the pores to keep skin clean. This toner is absorbed smoothly with a fresh feeling finish and without a sticky feeling. All skin types, day and night use. And the salesperson had informed me how this is also a very good toner to use if you have acne problems (which I do). Honestly I found this normal? I don’t think there is any alcohol in it because it doesn’t sting. But it is very refreshing so it definitely does leave you with a “fresh feeling finish.” It comes with a pump top so I definitely loved using this because it is so easy to use! Unlike some other toners where you have to tilt it over and pour some out and etc. Bottom line: I don’t think this did anything for my acne but I loved how it made my face feel lovely and fresh. It did clean my face further, especially removing residue of my mud masks whenever it is mask night! But for $30, I don’t know, I think it is somewhat worth it, but skip it if you are short on cash.